Word out of the South Slide is that Pittsburgh Steelers quarterback Ben Roethlisberger was able to practice in a limited capacity on Thursday and is holding out hope that he can play Sunday at Heinz Field vs. the Cleveland Browns. Per Dejan Kovacevic of DK on Pittsburgh Sports, Ben Roethlisberger practiced in a limited capacity. While news of Ben Roethlisberger practicing is by definition good, it also comes with a danger. Ben Roethlisberger clearly wants to play vs. the Cleveland Browns, and his desire is understandable. All of those spell “Must Win” for the Pittsburgh Steelers. While Landry Jones closed out the Steelers games vs. the Cardinals and the Raiders with “saves,” to borrow a baseball analogy, he struggled in his first start vs. the Kansas City Chiefs. A healthy Roethlisberger gives the Steelers a better chance to win. That’s a no brainer. Steelers head coach Mike Tomlin seemingly has a difficult decision to make. But it shouldn’t be hard at all. The Steelers should not play Ben Roethlisberger vs the Browns unless he is absolutely 100% healthy. The Steelers situation is not at all unlike the one they faced in 2011. Ben Roethlisberger injured his ankle in a Thursday night game vs. the Browns. Roethlisberger stayed in the game and put on a performance that was nothing short of heroic. After the game Roethlisberger vowed to play in the Steelers upcoming game at Candlestick Park vs. the 49ers. Everyone remembers that game as the game that prompted Roger Goodell to suspend James Harrison. But the more important news coming out of the game was the choice Mike Tomlin had to make at quarterback. Mike Tomlin opted to play Ben Roethlisberger. Even when it was clear that Roethlisberger was nowhere near 100%, he kept Roethlisberger in the game, despite having Charlie Batch in the bullpen. Given Batch’s rustiness in coming off the bench at times, Tomlin’s decision to start Roethlisberger was understandable. But Ben Roethlisberger was hurt so badly that he could not even make it back to the line of scrimmage after long completions during the hurry up offense. The San Francisco 49ers beat the Steelers 20-3 that night. Worse yet, Ben Roethlisberger was sacked 3 times and threw 3 interceptions. Tomlin started Batch as the Steelers shut out the St. Louis Rams the following week. Ben Roethlisberger returned for the Steelers 2011 season finale vs. the Browns, and then for the playoff loss at Denver. But Roethlisberger clearly wasn’t the same quarterback. Fans remember many things about the playoff loss to Tim Tebow, but Mike Wallace dropping a sure touchdown pass is one of them. While that added fuel to the anti-Wallace bandwagon, the truth is Roethlisberger couldn’t deliver on that pass because he was playing hurt. The Steelers resigned Ben Roethlisberger to an 108 million dollar contract this off season. It was the right move for all parties involved. All signs indicate that the Steelers have the nucleus of players around Roethlisberger on both offense and defense to make a serious Super Bowl run in 2016 and perhaps that window extends into 2017. But none of it will matter much if Ben Roethlisberger is too injured to play. If I am feeling good enough and if coach determines I am well enough to be out there Sunday, then that’s the goal. I can’t give you a percentage because my percentage is probably different than his percentage. While it’s impossible to read tea leaves here, it at least seems like Mike Tomlin is taking a more cautious approach to keeping his starting quarterback healthy than he did in 2011. And if that’s a welcome sign. Let’s repeat it for prosperity: the Pittsburgh Steelers should not play Ben Roethlisberger vs the Browns if there’s even a shadow of a doubt about his health and mobility. The Steelers did get some good news with no strings attached on the injury/practice front, as starting running back DeAngelo Williams practiced fully after missing the previous two days. William’s absence at practice highlighted the Steelers thin depth at running back, leaving only Jordan Todman and Isaiah Pead behind him. All of the news was not good, however. James Harrison, Ryan Shazier and Shamarko Thomas all missed practice, and will presumably not play vs. the Browns. The Watch Tower was quiet during much of 2011. Rest assured lack of time and not lack of motive explains the absence. Unfortunately the long layoff means a lot will go uncovered, but those are the breaks. The media has given us plenty to chew over, and the Watch Tower first shines its light on the Hines Ward situation. Having It Out for Hines? Steelers Nation knew the day would at some point, and the juncture was reached in 2011 when Hines Ward lost his starting job. It was a sobering moment to be sure, but one that came with a captivating back story. Writing on PG Plus, Ed Bouchette was the first to note Ward’s demotion, commenting on Ward’s lack of play at Cincinnati, and discounting Mike Tomlin’s denial that Ward had dropped on the depth chart, reminding readers that Tomlin had spun the same line about Randel El a year earlier. The “Dean” of the Steelers press corps is pretty consistent here. However, writing on December 21st, Bouchette, discussing Ward’s quest to get break the 1,000 catch mark, flatly changed his tone charging “They’re not even giving him the chance.” It would appear that Bouchette, it was in fact wrong that Ward was now the 4th or 5th wide receiver. It seems to me, someone has it out for him. Going from not giving a player his due to actively trying to keep him from breaking milestones is a huge leap, and one which Bouchette made without offering any type of reporting or indirect reporting to support such a bold assertion. The season’s final two games made it quite clear in fact, that the Steelers were going to try to do everything to give Hines Ward is 1000 catches, in fact if memory serve, Mike Tomlin even went into the finale having informed the TV broadcast team that this was his intention. Bouchette’s bravado looked quite foolish, at this point. There are some on the coaching staff who don’t want Ward back. In fact, one member of the staff didn’t want him back in 2010. Lolley then went on to explain that management put its foot down and insisted that Ward be welcomed back, and predicted (as did Bouchette) that they will do so again in 2012. This is a tremendous piece of reporting by Lolley (why he put this in his blog and not his paper is mind boggleing). If Lolley’s right, and there is every reason to suspect he is, someone on the Steelers coaching staff really does not like Hines Ward, because Number 86 caught 95 catches in 2009. The said coach is also more than a little stupid, because Ward followed that up with 59 catch effort in 2010, scored a key touchdown in the playoffs vs. the Ravens, and would have been the Super Bowl MVP had the Steelers defeated the Packers. As for the coach who wanted to cut him, let’s just say it was somebody who had some say in those things, but not the final say. If nothing else, Lolley is, most likely, telling his readers that Mike Tomlin is not the one who has it out with Ward. That would leave the other offensive coaches. It wasn’t Scotty Montgomery, who joined the staff as wide out’s coach in the spring of 2010 ,and likely would have no standing to make such a bold claim. Randy Fichtner is also an unlikely candidate, if for no other reason than one of the enduring images from the horrid loss at Cleveland in 2009 was Fichtner comforting Ward on the sidelines. So I guess that leaves us with Bruce Arians, although that’s only a guess…. Bouchette, apparently couldn’t let it go. But while the first case was a clash of opinions, Bouchette followed up with some statements that were flat out wrong. Just how does Bouchette conclude that Cowher and his coaches “did everything they could to find someone else…?” Reality fails that statement. After his awful 1998 season, the Steelers, with Cowher’s assent, gave Kordell a new, lucrative long-term, contract. In the 1999 draft the Steelers made attempt to move up to take one of the five quarterbacks taken before their first round pick. Kordell’s 1999 season was worse than his 1998 season, yet the Steelers passed on the chance to take Chad Pennington during the 2000 NFL draft. And after a strong, but not spectacular 2000 season, the Steelers again opted to allow Drew Breees and Quincy Carter to remain on the board, taking Casey Hampton and Kendrell Bell instead during the 2001 NFL draft. Ed Bouchette is entitled to his opinions about how the Steelers coaches mishandeled Kordell Stewart – he’s right to a certain extent and he’s got plenty of facts on his side – but he’s not entitled to ignore basic facts that happen to be inconvenient to his argument. Did the Steelers Snub Russ Grimm? Now that the Watch Tower has thrown Bouchette under a bus over Kordell Stewart, let’s give the man credit for some truly excellent reporting. As most Steelers fans know, there was initially some confusion over who would succeed Bill Cowher, with conflicting reports that the job had been offered to Russ Grimm and Mike Tomlin. Art Rooney II explained afterwards that he had gotten as far as discussing prelimary contract numbers with Grimm, but insists that no offer had been extended. And that’s where the story stood for four years. Russ Grimm was portrayed in the press as disappointed at not getting the job, but said all of the right things leading up to the Steelers game vs. Arizona in 2007 and again repeated all of the right things before Super Bowl XLIII. He [Russ Grimm] believes he was told by Art Rooney that the job was his after Bill Cowher quit. He even had a part to celebrate. Later, he was told that it wasn’t a done deal and then that Mike Tomlin was hired. Bitter doesn’t describe it. He is the Cardinals line coach and assistant head coach, just as he was in Pittsburgh. Still pretty innocuous stuff, although the news of Grimm having held a party and his bitterness (in contrast to public statements) are new news. Grimm believed all along the job was his because, in my opinion, they led him to believe it. Now it comes down to specifics. Those close to Grimm say Art Rooney told him “Congratulations, you are the new Steelers coach” and Grimm and his friends and family celebrated. However, the Rooneys insist that he was never told that and what he was told he misinterpreted. The “’Congratulations’” quote amounts to an impressive, and unprecedented piece of reporting. Clearly it Bouchette’s sources are 3rd and 4th hand, but he takes the story farther than it’s ever been and in doing so he delivered the goods that make PG Plus worth the 17 Argentine pesos it costs monthly to subscribe. From the grade book of a teacher who sees that their star pupil gave it all, but just couldn’t get it together when it counted, so goes the Steelers report card for their Wild Card loss to the Denver Broncos. LaMarr Woodley was not a pass rushing force but came up with a key fumble recovery, and Lawrence Timmons was second on the time in tackles with one tackle for a loss. And the unit did well in containing the run. But James Harrison was not a factor in the pass rush, and seemed bewildered as to how to read Tebow’s options. James Farrior was not much of a factor. The bottom line is the Steelers needed much, much more from this unit, and that was not to be found. 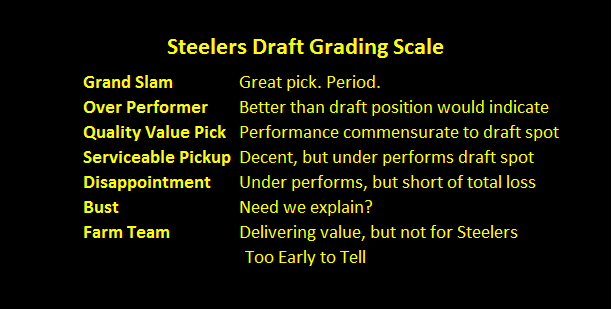 Grade: D.
Had the Steelers won the game Ben Roethlisberger, Isaac Redman, or perhaps even Shaun Suisham would have gotten the game ball. But this young man led the Steelers receiving crops, and did it and impressive way, reminding everyone of why he, and not Antonio Brown was the player coaches were touting for greatness heading into 2011, and for that Emmanuel Sanders is Unsung Hero for the Steelers Wild Card game. With each passing day the news out of the South Side gets worse. First Ben Roethlisberger revealed that he suffered a set back vs. Cleveland. Then Maurkice Pouncey showed up on the injury report. Then word came that Pouncey was out for the playoff game vs. Denver. Both those men are relatively lucky. The Post-Gazette reported that Pittsburgh Steelers running backs coach Kirby Wilson was burned badly when his town home caught fire last night. The burns are reported to be moderate to severe, but not life threatening. He is reportedly under the care of UMCP-Mercy Hospital. This is just the latest blow that the Steelers running game has suffered, dating back to training camp. First rookie Barron Batch, who’d been the star of camp, tore his ACL at St. Vincents. For the first three quarters of the regular season the position remained stable for the Steelers. Then Jonathan Dwyer injured himself in the Cincinnati game went on injured reserve. Then Mewelde Moore sprained an MCL vs. San Francisco. Rashard Mendenhall appeared to be coming on strong as the Steelers were entering the stretch run, only to tear his ACL in the season finale vs. Cleveland. Now they must rely on Isaac Redman to lead them, and Redman must do it without guidance from Wilson, the man whom he credits from helping him grow from being a practice squad wonder to a legitimate NFL running back. Injury news of course gets much worse, but high ankle sprains appear almost to be a class into themselves. They’re not career threatening, nor (does it appear, yours truly has no medical expertise) does their long-term impact appear to be cumulative. Nonetheless, high ankle sprains linger and linger. As a fan it has always seemed that when a player suffers the dreaded “high ankle sprain” he’s effected by it for the rest of the year. Both suffered them during the Thursday night game vs. Cleveland. Pouncey hasn’t played since, and after missing practice on Thursday might not play vs. Denver. Ben Roethlisberger of course played in the next game vs. San Francisco, and in Steel Curtain Rising’s analysis, Roethlisberger had no business finishing that game after it became clear that injuries had drastically reduced his effectiveness. At his weekly press conference Mike Tomlin said that Ben was fine, having suffered no further setbacks as a result of playing in the second victory vs. Cleveland. Ben Roethlisberger told a different story, claiming that he had in fact hurt himself in the third quarter, and he missed practice on Wednesday but was back at it on Thursday. Roethlisberger is some what of a drama queen when it comes to injuries, but Ed Bouchette noted on PG Plus that Roethlisberger looked hobbled in the locker room on Sunday after the game and he is expected to play. The 2011 Steelers have over come a lot in terms of injuries, but suffice to say this is not the kind of news you want to read if your team’s about to play its first road playoff game in six years. Today’s news confirmed the worst for the Pittsburgh Steelers and Rashard Mendenhall, as Ed Bouchette reports on PG Plus, as are numerous other sources reporting, the Mendenhall did in fact tear his ACL. That leaves the team with 3 running backs heading into the playoffs, in the form of Isaac Redman, John Clay, and Mewelde Moore. Mendenhall is not the only injury the Steelers suffered in defeating the Browns. They lost cornerbacks Keenan Lewis to a hamstring injury and Cortez Allen to a separated shoulder injury. While neither injury is expected to be season-ending, their availability for the playoff game in Denver has to be in doubt. Factor in the fact that Ryan Clark will likely be unavailable to play, and the Steelers are mighty thin at defensive back for their first road playoff game since visiting Denver for the 2005 AFC Championship.